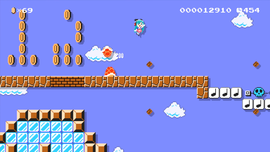 ♪Yu Ayasaki's Big Adventure!♪ is an Event Course in Super Mario Maker, released on March 20, 2016. It unlocks the Yu Ayasaki Mystery Mushroom costume upon completion. The level begins with a Mystery Mushroom, along with some Brick Blocks that can be cleared with a P Switch. Mario must then hit a ? Block containing a beanstalk and climb it to an area with coins arranged to read "9129", followed by a Lava Lift. Mario must enter a warp pipe, which leads to the Checkpoint Flag and a Koopa Clown Car, which he can use to obtain a Key from an area with Skewers and unlock a Key Door. Next, he must navigate through some Bumpers, then enter a Fire Koopa Clown Car and get past some more enemies before grabbing another Key near some Fire Bars and open a second Key Door. Mario must then follow the conveyor belts to another warp pipe, which leads to some coins arranged to spell "NY", along with some Note Blocks and the Goal Pole. This page was last edited on March 30, 2019, at 02:20.